The four best teams in the NFL are left fighting for a spot in the super bowl XL. The Saints are going against The Rams, and the Patriots are taking on the Chiefs this Sunday 1/20/19. This playoff game determines who is going to the Superbowl game. Out of 110 students, 54 said the Patriots would win and 56 said that Chiefs would win, so this match is determined to be a great one. Out of 110 students, 72 students chose the Saints to win, and 38 chose the Rams. There seems to be a lot of disagreement on who will take this year’s Super Bowl. While some are sure that Tom Brady will win his 6th ring, others are placing their money on the New Orleans Saints. ” I think the Saints will take it all, they’ll beat the Patriots 23-18,” senior Rogelio Rubio said. This comes to show that most of Morton believes that the New Orleans Saints will win super bowl XL, and Drew Brees will get his second Super Bowl ring. 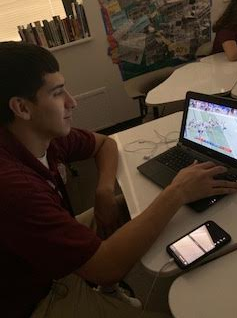 Senior Aurelio Servin watching the NFL game. I knew the Patriots would win because they are a great team. My friends and me gathered together and order a food so we could watch the game. We were disappointed after the game because it wasn’t action packed like we thought it would be.